This is for all those middle school teachers out there... This year I am back in middle school after several years away. IT started out with 15 students that signed up to take the class. We began work on devising our own play. This group was excited about performing for a younger audience so we focused on a story that grades 1-4 would like. We chose a story and have been reworking it. Last week 10 students were added who do not want to be there. Now I have an us and them situation and in addition two of my students from the first group are having meltdowns and are not participating. I am at a loss as to how to make this work. I am thinking about scraping the original play and doing something else, but first I have to get this group to work together. Many of them do not want to act...... THoughts? Ideas? I'm sure you have thought of this, but the students who don't want to act can be on construction and/or running crews. I have one now that has panic attack at the simplest performance exercise, but excels as a writer and director. Have a straight conversation about everyone needing a job of some kind, and plumb them for what they're interested in. In my set up, 5/6 grades are required to be in my class for one quarter and I have the same problem. Some want to be there, some don't, so like Josh, I get them to be costumers, set builders, writers, publicity crew, props, etc. Often, those students end up then electing to take class in 7/8 grades. Some continue to stay behind the scens and others finally get up the courage to try performing. Hope this helps. Try a more modern approach, like have them create and act "on camera" with their phones in commercials, music videos, broadcasts, school "soap operas," or super hero clips. Give them a purpose for acting, like doing a play for younger children to raise money for St. Jude's, or do something for a special teacher or the school itself. Do Reader's Theatre so they don't have the pressure of memorizing. Have them write and act out the "story" from one of their favorite songs. Have them write comic strips or Comic books to create stories, then bring those to life. OR have them create a complete story using Tableau's still shots, take the pictures, then create a slide show to tell the story. Show them a clip from Hamilton, then have them write RAPS to perform. Anytime you can use music, technology, their iphones, video, and especially empathy for others, it helps so much! Break a Leg! Running tech is a great idea. If you would like to have a fun alternative, take a look at these two books. You can legally copy the script for school use. Great, short little plays for young audiences. Martin. 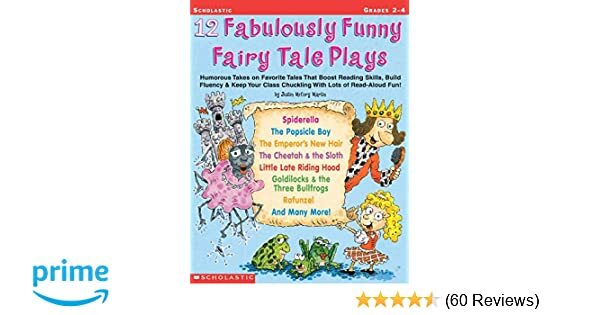 12 Fabulously Funny Fairy Tale Plays: Humorous Takes on Favorite Tales That Boost Reading Skills, Build Fluency & Keep Your Class Chuckling With Lots of Read-Aloud Fun! Thank you to everyone who has responded. Yesterday at the end of the class we had or tried to have, a discussion about the class. Three things came out... "I talk too much", they want to be in groups- backstage, playwriting, and acting and they need time to talk in the morning. Sooooo... this morning I put the directions on the whiteboard which they see as they come in- I did not say a word for the first twenty minutes of class - all directions were already written down for each group. I used everything but voice to communicate what my expectations were. It worked for the most part.... some of them now think I am very weird!!!!! By the end of the class it was clear I have two groups and we need to regroup concerning our play. One student who had originally come in with a huge attitude- she arrives late everyday with permission due to family stuff- took over the leading of the discussion and we now have a direction for the next few days anyway!! It helped that they realized that I heard them and was willing to make adjustments. Still have some drama- and refusals but I will keep working on loving them and trying to understand all the crap they deal with on a daily basis which has nothing to do with school. You have received some great advice here. I, too, have an issue with late incoming students due to them passing their remedial math and reading classes mid semester. We were in the middle of casting for a one-act. Here is what I did: find a way of separating them out, or rather integrating them into the original class. Set up a few classes where the original students can work independently and you can spend time initiating the "newbies" into your class, introducing your rules and routines, and playing some fun acting games. This will give you and them an opportunity to positively bond without the pressure of the "seasoned kids" and it will give the experienced ones a chance to flex their independence. At the end of each class, provide opportunities for the two groups to highlight their best work. I admire your willingness to forfeit your "control" and try new things. I tell my kids that in order to do great backstage work, they should try some acting games and exercises so they can empathize with the actors they may eventually direct or work behind the scenes for. I would stick to your original play idea if you are fully invested with your first group, and define specific roles the new students can perform to supporting the production. I wish you luck! I have a t-shirt in my EclecTech Shoppe on my website that reads: "NO, I WOULDN'T RATHER BE ON STAGE". Cathy your first post contained the words "Many of them do not want to act." Never a truer word spoken. I don't believe it's a question of waiting until students who are doing tech 'get up the courage' to try acting, any more than waiting for students who are acting to get up the courage to do tech. Some do both, as mentioned, but many simply do not want to. For anyone who doesn't have much in the way of tech opportunities at a middle school theatre (or lack thereof) there are still things you can do to engage your techies. Check out Kristin Hall's curriculum ideas in George Ledo's discussion: Question about teaching lighting design . Kudos to everyone teaching tech at the middle school level! I only popped in here because I saw Beth Rand's name on the "poster" column, :-) but I have to agree with the above: you can't force someone to act or do tech anymore than you can force them to play football or basketball if they're not interested. Back in college, we theatre majors were required to take classes and labs in all of it, and it was intended to give us a solid introduction to all areas of theatre. But that's what we signed up for: we were theatre majors and we knew the requirements before we applied to that university. Me, I was a confirmed techie who went on to design sets, but I still had to take acing, directing, mime, and other subjects I had no interest in. They came in handy later, but I didn't know it at the time. But middle school? If they don't want to act or do tech, find something else for them to do. Everyone will be happier. Hmm, this is tough. I teach middle school and am BEYOND LUCKY that most of my kids want to take my class (or at least want to take the other ones less! ha!). I do have a slight "us vs. them" situation with my kids who participate in extracurricular theatre and those who don't. I would suggest doing some group activities in which you mix up all of the students, and somehow incorporate your devised piece. Maybe they could present the work you've created so far, and take suggestions for what to do next? Then, from that moment forward, everyone is "caught up" and part of a unified group. I know it sounds way easier on paper! And yes, most definitely provide alternate opportunities for those who don't want to act!